The No. 12 Salisbury University men’s lacrosse team lost to No. 7 Stevenson in a tough overtime matchup, 9-8 yesterday at Sea Gull Stadium. Sophomore attack, Carson Kalama and senior midfielder, Sean Fitzgerald had a great connection early on. Kalama scored the first four goals for Salisbury, while Fitzgerald added three assists to Kalama, as Salisbury was able to maintain possession for a majority of the first period. Fitzgerald, Thomas Cirillo, Nathan Blondino and James Burton added additional goals for the Sea Gulls. The Sea Gulls struck first just over a minute into the game where Kalama gave the Sea Gulls a quick 1-0 lead, but Stevenson answered quickly on a break away a little over a minute later. The Gulls took a 3-1 lead after Kalama and Fitzgerald connected two more times for quick goals, but Stevenson would add another goal with five seconds remaining in the period as Salisbury took a 3-2 lead into the second quarter. Stevenson would strike back quickly at the start of the 2nd with two man-up goals to give them a 4-3 lead. Kalama would then add his fourth goal of the night with 8:28 left in the second. After another score by Stevenson, Fitzgerald added a goal of his own ripping it to the top right of the goal, with the assist from midfielder, Thomas Cirillo to make the score 5-5 at the half. At the half Salisbury led in shots 18-11, ground balls 14-13, and won 7-11 faceoff opportunities. But the Sea Gulls were 0-3 on man-up opportunities, while Stevenson was 3-3. Junior midfielder James Burton added the only goal of the 3rd period at the 12:10 mark to give the Sea Gulls a 6-5 lead heading into the 4th. Stevenson maintained possession for a majority of the 4th period and was able to add three straight goals to take an 8-6 lead with just under 3 minutes left to play. With 1:10 remaining Cirillo scored a goal for the Sea Gulls to bring the score to 8-7. After winning the next face-off the Sea Gulls immediately called a timeout to talk about a game-tying play. It was Fitzgerald passing to Blondino who shot the ball right past the Stevenson goalie with 11 seconds remaining to tie the game at 8-8 and forcing overtime. The Sea Gulls won the face-off in overtime, but were unable to land their two shots on Stevenson. With 1:22 left in overtime Stevenson was able to score the winning goal. Salisbury will be on the road for its next game, traveling to Southern Virginia University on Saturday, March 28 starting at 1 p.m.
As the final innings came to a close of the 2014 women’s softball Division III National Championship the Salisbury University Sea Gulls had their remarkable season come to an end losing the series to Tufts, 2-1. For their efforts in the 2014 season, head coach Marge Knight and her coaching staff were named the NFCA Atlantic Region Coaching Staff of the Year for the third straight season and now, the Salisbury women’s softball team is about to begin their journey in 2015 in order to capture a national championship. The Sea Gulls will begin their 2015 season with a lot of confidence as many of their key players are returning from last year’s team after a 44-5 record. Ace pitcher Rachel Johnson returns to the mound as a senior while Kim Dorsey and Paige Knussman return as juniors as the staples of a well-rounded line-up. All three players all earned First-Team All-American selections and Johnson was 2014’s Capital Athletic Conference Player of the Year and a member of the NFCA All-American First Team. Johnson posed a 29-4 record with a 1.35 earned-run-average in 2014, while Knussman led the team with a .516 batting average. 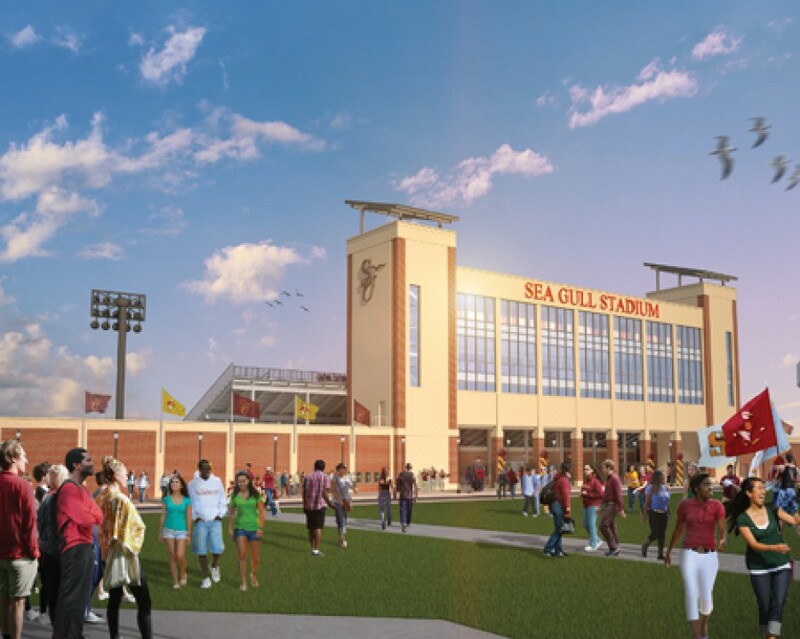 In 2014, nine Sea Gulls batted with an average over .300 to give the Sea Gulls plenty of offensive power. Dorsey was an important piece as well as a sophomore and led the Sea Gulls last season in the scoring department – crossing the plate 63 times – and was second on the team with a .422 batting average. Still, the Sea Gulls have improvements to make and despite the numbers, they came just short of their ultimate goal last season. They plan for things to be different in 2015. Even with the great numbers from last year’s team, and the long history of excellence for the Sea Gulls’ softball team, Knight – the team’s veteran skipper – is always trying to make her team better than before. Knight has been a model of consistency in her time at SU, entering her 19th season as the head coach of the softball team. In that time, she owns a 680-145-2 overall record and has tallied 17 NCAA tournament appearances, including eight trips to the World Series. With a familiar roster and a few new faces the Sea Gulls are poised to make another run at a conference championship, another Division III playoff appearance and another World Series run. The trio of Johnson, Dorsey and Knussman will lead the way while Katie Sebbane, Molly Simpson and Rebecca Hoey, all CAC- First Team selections in 2014, will chip in and play key roles. CAC coaches have also tabbed Salisbury as the top team for 2015 and the No.2 team in the country in pre-season polls. The Sea Gulls are scheduled to open their 2015 season this weekend at the Grand Slam softball classic in North Carolina. There, the 2015 team will be tested for the first time in a long season that is coupled with larger than life expectations. Womens Basketball CAC Championship Video! Salisbury Women’s Basketball advances to the Sweet 16 after a strong second half! Winning 61-54! Go Gulls! Baseball vs Neumann – 2 p.m. Baseball vs St. Mary’s – 2:30 p.m. Baseball vs Stevenson – 1 p.m.
Men’s LAX vs Ohio Wesleyan – 1 p.m.
Upcoming Games This Week Feb. 23- Mar 1. Salisbury Men’s Lacrosse defeated Widener 12-2! The Sea Gulls now move to 2-1 on the season!